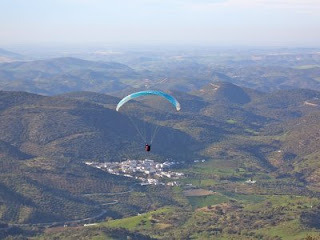 Slope with take-off (Paragliding): 415 meters. Slope with take-off (Hang gliding): 648 meters. Ownership of the Territory: Public. 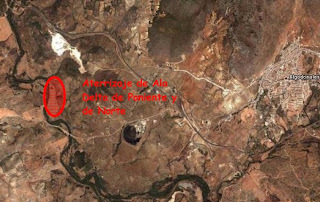 Access: Join the road that exists from La Muela in the Western direction (CA-9101) for 1 km., then you will find a diversion on the right that leads to a forest track that leads you to the take-off. At the beginning of the forest track there is a sign indicating the access to the take-offs. It is in a very good state of preservation. Parking: There aren’t any are of delimited area, although there’s space for about 7-8 vehicles, using the lateral side of the track as an access. Closest Population: Algodonales and District La Muela. Sign Posts: There isn’t any sign indicating that it is an area of take-off free flight. State of Preservation: The area where the take-off is located is in a good state of preservation, being a natural set up area. Pre-flight Area: There is one, but not delimited. Equipments: Attached Meteorological Station (Thank You “Toni Webb”) and shade area with tables and viewpoint. It has a boarding gate and wind ribbons in the lateral sides of it. Photo: Equipment and furniture next to the Western flight runaway. 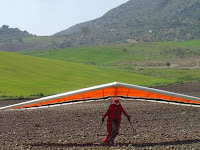 Slope with take-off (Paragliding): 434 meters. Slope with take-off (Hang gliding): 767 meters. 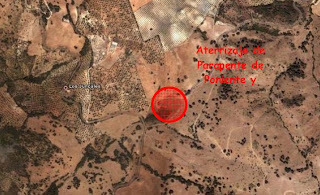 Access: Take the road that exits from La Muela westerly direction (CA-9101) for 1km., then you will find a diversion on the right that leads to a forest track that leads you to the take-off. It is not indicated with sign posts. Parking: Not delimited, the cars park next to the lane. The capacity is about 3-4 vehicles. 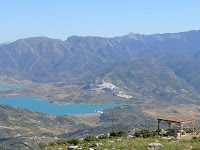 Closest Population: La Muela and Algodonales are a few kilometers far from it. State of Preservation: It is in a very good state of preservation. Pre-flight Area: It does not exist, the lane is commonly used. Equipments: Attached Meteorological Station and shade area with tables. Obstacles: Rocks and low vegetation and the right lateral side of the take-off. 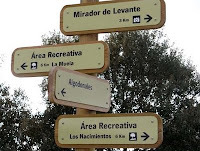 Access: Take the road that exists from La Muela in westerly direction (CA-9101) for 1km., then you will find a diversion on the right that leads to a forest track that leads you to the take-off. The take-off is past by the fire control tower. Parking: The upper part of the take-off esplanade is used as parking area, which is prepared with shade area, thanks to the wooden construction. When it is full, the width of the accessing lane allows cars in a row. Closest Population: La Muela and Algodonales. State of Preservation: The area where it the take-off is located is prepared, being its state of preservation excellent. Pre-flight Area: It is defined. 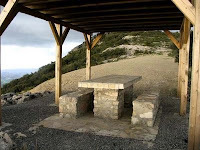 Equipments: Attached Meteorological Station, shade area with tables and viewpoint. It has wind ribbons in the lateral side of the take-off. Altitude: 990 meters. Slope: 604 meters. Access: Take the road that exists from La Muela in westerly direction (CA-9101) for 1km., then you will find a diversion on the right that leads to a forest track that leads you to the take-off. 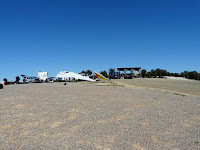 The take-off is past by the fire control tower and on the right the eastern take-off. Parking: The upper part of the take-off esplanade is used as the eastern parking area, which is prepared with shade area, thanks to the wooden construction. When it is full, the width of the accessing lane allows cars in a row. 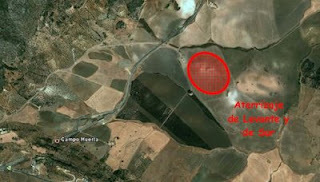 Closest Population: La Muela and Algodonales, very few km from it. Ownership: Public, of municipal property. Access: The take-off is located next to the bullring, besides the cross between the Road CA-9191 and A-8126. It is known in the area as “el descansadero de la Muela” next to the estate “Hermanilla” in the intersection of La Muela. Parking: There is a big esplanade next to the intersection for parking vehicles. It is not indicated with sign posts. Closest Population: La Muela, 3km far approximately. Sign Post: No. 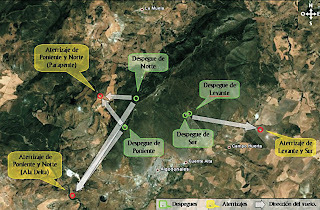 A sign of the Free Flight Infrastructure of Andalucía with the flight areas of Sierra de Lijar has been put recently. State of Preservation: In a good state, cleaning works have been recently made. Obstacles: High voltage power lines very near to the take-off area. Access: Join the road A-384, Northwest direction and at the Algodonale’s petrol station-high, join the paved road in front of you, at the back of a Bar and just before the river, turn right, the take-off is located on a flat surrounded of olive trees and the river course. The take-off is located at 2km far from the above mentioned petrol station. 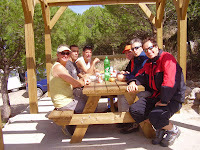 The area is known as “la pasada de Madrigueras”. Parking: No. The lateral side of the road is used instead. Closest Population: Algodonales, about 3-4 km far from it. State of Preservation: In is in a good state. Equipments: There are wind ribbons. Obstacles: The adjacent area to the river is skirted with trees. Ownership: Private but the marked territory in the picture is rented out by the City Council, so it is an authorized landing area, respecting the farming ground. 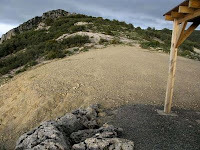 Access: From Algodonales, take the Road A-384 in the direction of Olvera. Once you have passed by the tunnel, at 12000 meters you should join a dirt road that exits on the right of the road, about 2000 meters you will arrive to a farmhouse, at the back of the farmhouse is the take-off. The access is in a very good state. The area is called “Campohuerta”. There are no sign posts indicating the access to the take-off. Parking: The space located next to the lane as well as the espalanade besides the farmhouse are usually used as parking. Closest Population: Algodonales, 2km far. State of Preservation: This is a fallow land. Very good state, it is usually plough and clean. is in a good state. Equipments: There is usually a windsock. P.S. Data compiled from the Study of the Flight Areas of Algodonales made by the Free Flight Infrastructure of Andalucía. Authors: Crisanto J. Calmarza, Antonio García and Marc Petiot.